The Obelisk of Slumber is an Arcane weapon. This arcane staff is slightly tingly to the touch and stands as a bright beacon designed to mesmerize mice that lurk in darkness. Its mysterious glow and refreshing minty smell gently coax unruly Forgotten mice into a deep sleep. The Obelisk of Slumber can be purchased for 316,350 gold from the Catacombs Trapsmith. It refunds for 56,943 gold at the same location. For "Hunters who were a little over-zealous with their hammers and smashed the Obelisk of Slumber trap before obtaining a piece of coal...", it is still possible to reconstruct the Obelisk of Slumber from Obelisk Parts through the use of the following crafting formula. The same formula is also applicable to hunters who wish to convert their Obelisk of Incineration back to an Obelisk of Slumber. Obelisk of Incineration – Source of Obelisk Parts for crafting. 10 February 2009: The Obelisk of Slumber was introduced along with the Hunter's Hammer. 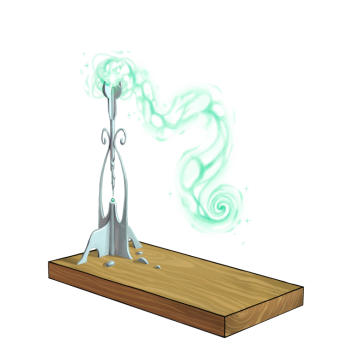 The Obelisk of Slumber was the first Arcane type weapon to be released.